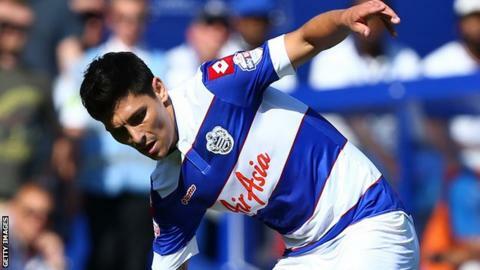 Queens Park Rangers have confirmed that midfielder Alejandro Faurlin faces up to nine months on the sidelines after suffering anterior cruciate ligament damage in his left knee. The 27-year-old Argentine was stretchered off in the 77th minute of Saturday's 2-1 win over Derby County. He battled his way back from a similar injury to his other knee in 2012. "It's such a shame for the lad. He gives us a good balance in midfield," said QPR manager Harry Redknapp. "The kid's got back into the team and played well and now that's happened to him." Signed from Instituto in 2009, Faurlin has made more than 120 appearances for Rangers. He was voted the club's player of the year in his first season at Loftus Road and had a key role in their promotion to the Premier League in 2011.